A sanctuary is a welcoming place of refuge and safety. In today's increasingly violent world, however, even our churches have come under attack. We no longer live in a time when we can ignore this fact and we must now find ways to protect our church families. This has led many church leaders to ask the question, "Where do we start?" Southern Mutual Church Insurance Company is responding by partnering with local law enforcement officials and key security consultants to provide our churches with the comprehensive information you need to create a security program suited to your church's specific needs. Over the coming months, we will update our website with guidelines, links, and a video to share the key principles you need to provide a more secure church campus, without losing the welcoming environment your church is called to be in the community. SMCI is receiving many questions and concerns from our churches, with the most frequently asked question being, "Can church members with a concealed carry permit bring their firearms onto the church premises?" This is a question that is becoming more common with the increase in violence. The final decision on allowing firearms on the premises rests with state law and the church leadership. However, if the church leadership decides to allow certain members to carry a concealed firearm, the church should be sure the person has a valid license/permit, along with firearms/security/safety training that goes well beyond what most states require to obtain a license/permit. Please note that just because someone has a license/permit doesn’t mean they should be allowed to carry a firearm on church premises, as some people are not suited to handle this responsibility. Obviously, this is a difficult issue and one that should be addressed in the church’s security plan. Be sure to enlist the expertise of local law enforcement and those in the legal field when developing your security plan. CLICK HERE for links to security/medical resources. Build your Church Security Program on a solid foundation. 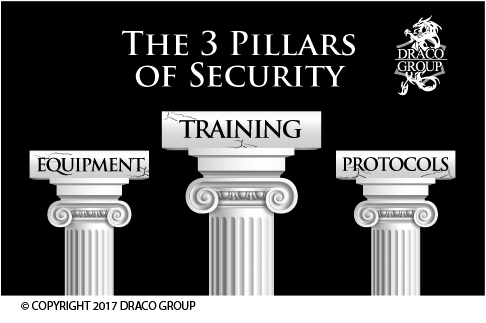 There are three pillars of security on which you should base your program. While you may be tempted to run out and purchase cameras for every corner of your buildings, without the proper protocols and training in place those cameras become an investigative tool after an incident. Your initial focus should be on protocols and training, then add equipment as tools to enhance the capabilities of your Security Team. Listed below are several suggestions to get your Security Program started. Know your vulnerabilities. Contact your local Sheriff's Department and ask if they have someone who specializes in security assessments. Alternatively, search for a security consulting firm in your area and have them come to your property to conduct a security assessment of your entire campus. Recruit volunteers. Form a Security Committee by first identifying a key member of the church to head the committee, someone who will be vigilant and passionate about their new role in the church, and then add as many other volunteers as you think is necessary to secure your church campus. Be sure to include any members of the church who are in the law enforcement or medical communities. Begin immediately. Do not wait. Once you have your security assessment in hand and a committee in place, immediately begin the process of building your Security Program. Immediately address the most vulnerable areas of your church campus. Build on the basics. Once the Security Committee has built a comprehensive security program, including training requirements, protocols, and incident response guidelines, have a church-wide meeting of all members to go over the program and the role of the average church member - child, youth, or adult - in the case of an incident. Medical response. All too often so much attention is placed on putting a security program into action, the medical response to a mass casualty incident is overlooked. You should also identify and recruit church members with a medical background to be a part of your Security Committee. They should be responsible for assessing the church's ability to respond in the case of one or more severe bleeding casualties. Every church should have multiple trauma kits staged throughout the church campus, along with several volunteers trained in the proper use of these kits.